Insurance fraud is a widespread problem, in New York, throughout the United States, and around the world. It involves many different types of insurance claims. Insurance fraud can be found in first-party claims, where the insured is seeking to recover more than he otherwise would be entitled to under his own policy, be it a homeowner’s, business owner’s or other commercial lines policy, or an automobile policy. It also can be found in third-party claims, where claimants seek to recover from the insured’s liability carrier for loss or damage that did not occur, which the insured did not cause, or for exaggerated or pre-existing damage or injuries. Its impact is well known: Insurance carriers incur higher costs, including expenses to investigate and defend against fraudulent claims, higher claims payments and lower premium income. The Coalition Against Insurance Fraud estimates that insurance fraud schemes steal approximately $80 billion a year. Policyholders are forced to subsidize, through higher premium payments, the claimants who collect on fraudulent and/or exaggerated claims. The National Crimes Bureau estimates that insurance fraud adds $200-$300 per year to an individual’s insurance premium. The fraud is attempted through everything from complex schemes to mundane lies. What makes it important is not so much how it’s done, but its prevalence. Sometimes the insurance fraud schemes are ingenious. In March 2013 an upstate New York man was arrested because he was found in possession of a tilt bed truck and vehicle identification number, both of which were stolen. Even though he was caught and arrested, the man still could be considered clever: The truck he was found with actually was built from two other, stolen trucks. Sometimes the insurance fraud schemes are mundane. In March 2013 an Oneida County, New York, man was arrested for insurance fraud. He made a claim under his homeowner’s policy with Liberty Mutual Insurance Company to recover $11,779 for water damage to his residence, and submitted a sworn statement in proof of loss in support of the claim. It turned out, however, that there was substantial evidence that the water damage he tried to recover for was actually pre-existing damage; it was there before the date of the claimed loss. As it turns out, that was neither clever nor effective. Sometimes the insurance fraud schemes are brazen. A Nassau County, New York, woman recently was arrested for insurance fraud in the 3rd degree and for offering a false written statement. She filed a homeowner’s claim to recover for fire damage to her house. Hartford Insurance Company issued a check, for $33,596, to pay the claim. The check, however, was made payable to the woman’s ex-husband, who still was the named insured on the policy. The woman notified Hartford that she did not receive the check, so it sent her a duplicate, which, like the first, named her ex-husband as the payee. An investigation turned up evidence that the homeowner received both checks, gave each to her son who, because he had the same name as his father, the woman’s ex-husband, was able to deposit each into his personal account. The woman then was able to withdraw the funds from her son’s bank account using an ATM card. For the same reason, it was both clever, since the right name was endorsed on the two checks, and not well-thought out, since there were two checks on which the right name was endorsed and a clear record that each had been cashed. Sometimes the fraud schemes simply do not add up. A man was arrested in March 2013 for falsely reporting that his 2008 Honda had been stolen. He claimed that he last saw the car when he parked it on a Queens, New York, street at approximately 0120 hours on February 8, 2013, and that he had all the keys to it. 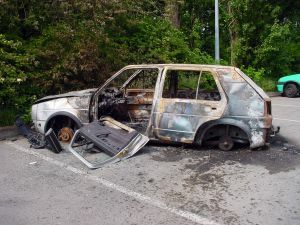 The Mount Vernon, New York, police, however, recovered the car, after it already had been burned, more than a full day before the man claimed he last saw it. As insurance fraud continues to proliferate, involving disparate claims, means, and methods of execution, carriers’ tools also need to expand. A good example is the use of “Big Data,” i.e., the large amount of information, in digital form, readily available to insurers on their vast number of claims. Using it, rather than ignoring it, has the potential to lead to more well-informed decisions on who, what, and how to investigate a potentially fraudulent claim. Combined with the intuitive judgements and experiences of their SIU representatives, the use of Big Data through tools like text mining, has the potential to enhance carrier’s anti-fraud efforts, which will be to everyone’s benefit. The use of Big Data will be the subject of subsequent articles.